Faced with a grim scenario, Air India management has asked its employees to consider the financial crisis facing the company and accept proposals to cut wages and other costs in order to avoid job losses. 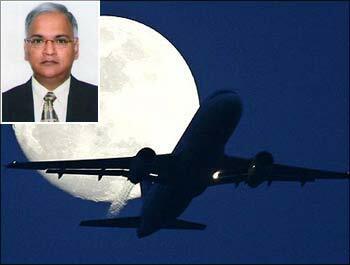 These views were expressed by Air India chairman and managing director Arvind Jadhav at his meetings with leaders of 14 unions, where he is understood to have articulated various scenarios which could arise if costs were not managed well. Airline officials said Jadhav also told the union leaders that if the losses continued, the company would have to prune its operations which could lead to lay-offs and retrenchment. However, the officials categorically denied any move for a lockout or referring the company to the Board for Industrial Finance and Reconstruction (BIFR), saying at no stage of these discussions were any such references made. While the airline management announced timely payment of salaries to its employees, it said determined efforts would be made to overcome the liquidity crunch and cut down costs, particularly in areas like rentals for leased aircraft, jet fuel, navigation charges and interest payments on fleet renewal. Jet fuel costs amount to almost 40 per cent of the total operational costs of the carrier, which is followed by expenses on salaries, wages and various allowances including productivity-linked incentives (PLI). It is understood that during the talks, the airline management proposed to merge PLI with the basic pay of various section of employees and match them with the scales and allowances recommended by the Sixth Pay Commission and in accordance with the Department of Public Enterprises guidelines. At their earlier round of meeting in Mumbai last week, the management had decided to cut incentive payments by half. Image: An Air India Airbus at the Mumbai airport. The cut, as per the proposal placed before the unions, would be in effect till an alternative formula for governing PLI was worked out within three months. The formula governing incentives is to be linked to the company's performance in terms of on-time performance, yield, seat factor, operating margins and profitability. The meeting was held as the unions staged hunger strike at various places across the country. 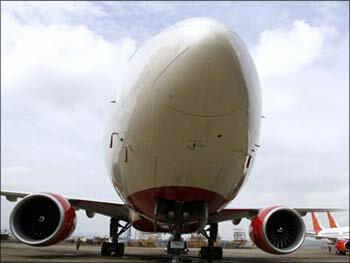 However, most of the unions have already decided not to go on a full-fledged strike keeping in view Air India's health. 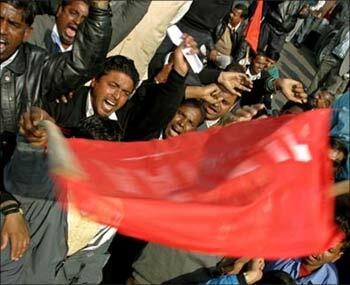 Image: Striking Air India employees.